According to futurists, the likelihood that humans will one day have to move off of the land and into the oceans at some point is high. Population growth, climate change and limited resources could eventually push us into the waters that cover more than 70 percent of the planet. 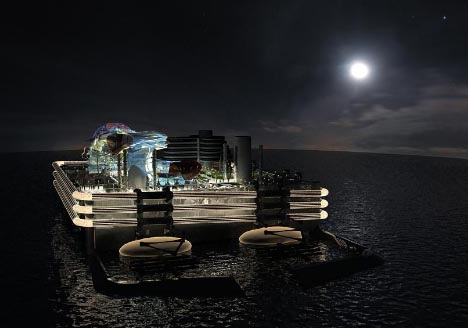 The Seasteading Institute wants to be prepared for that eventuality, so in 2009 they sponsored the Seastead Design Contest. 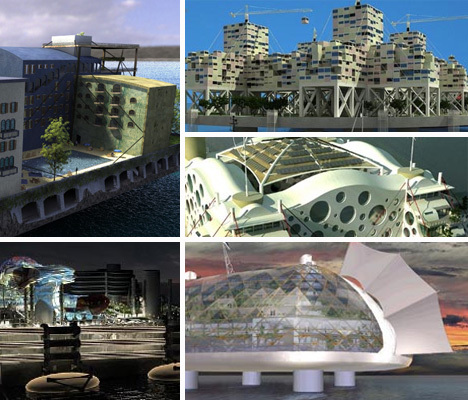 The contest asked for designs that imagined permanent, stationary structures that would allow for long-term ocean living. These five designs came out on top. 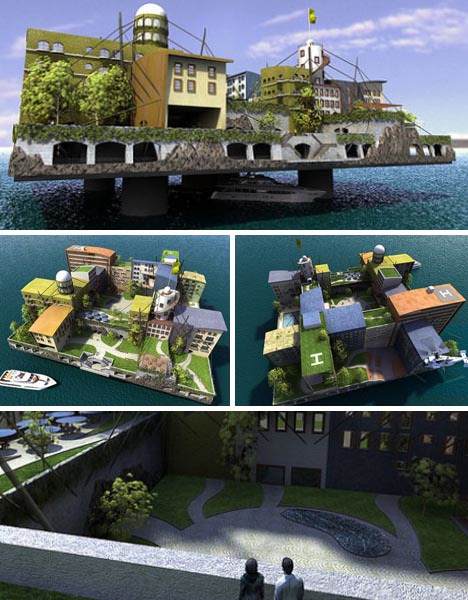 The Swimming City is a vibrant seastead design from András Gyõrfi that looks like a section of a traditional city that was cut from its surroundings and relocated to the sea. The traditional architecture and familiar city structure give it the type of familiarity that would make it easy to live in for former land-dwellers. Homes, businesses, and public recreation spaces all co-exist happily. The city has a number of helicopter pads for easy access from the air and a central dock for water access. The “city” is actually the size of a single neighborhood, so imagine a network of these communities, each supported on its own four pillars just above the water, forming a true city of the sea. The contest judges decided that this design by Anthony Ling had the most personality. The Rendering Freedom design is not only about building a city for today, but about leaving open the possibilities for growth and change in the future. Modular construction on a stationary platform would mean that changing and adding to the existing buildings would be simple. 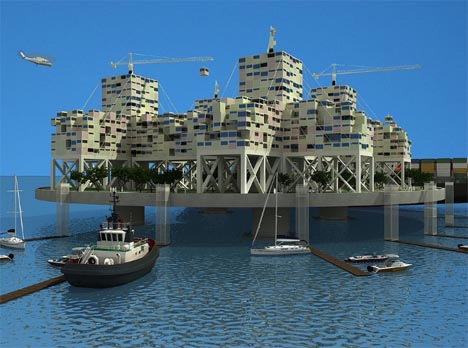 An inventive elevator system would take visitors and residents from the floating docks at sea level to the raised “ground” level of the city platform. The buildings themselves are even further elevated to help protect them from large waves. If it were on the land, this design could easily be mistaken for an upscale resort. 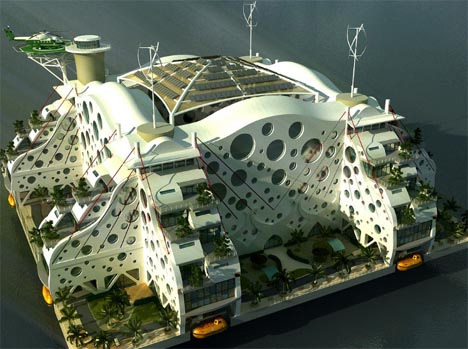 The designer, Emerson Stepp, wanted to convey a sense of luxury to help ease the adjustment from living on land to life at sea. The Oasis was meant to harmonize with the surroundings without simply fading into the background. The seastead’s architecture is designed to withstand the incredibly harsh environment that would plague an ocean colony, but the lush vegetation and organic design would help to make residents feel less like they live on a platform in the middle of a strange environment. Designed with sea-worthiness in mind, this enclosed city from designer Marko Järvela uses thermal and functional zoning in its layered interior to keep utility consumption down. Passive solar design principles are also in use to take advantage of the ocean sunshine. Inside the enclosure, extensive vegetation cleans the air, improves the aesthetics of the seastead and provides food for the residents. 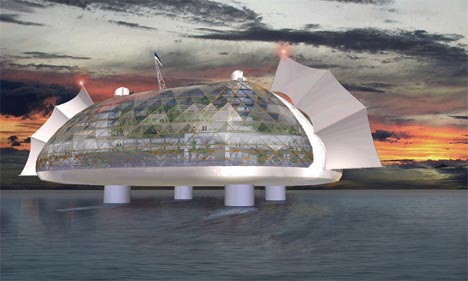 Designed as an ocean-bound research facility, Refusion won the community choice award in the Seastead contest. From the five-man Team 3DA, Refusion challenges the public to think differently about seasteads in general. They don’t have to be industrial and boring or outlandishly futuristic; they can be functional and beautiful, and they come with a unique set of advantages. Being out in the sea means near-complete freedom and independence. For ocean researchers, a permanent seastead research environment affords an unprecedented amount of data collection opportunities.